Random! Just finished watching Glee (which I'm finding myself watching less and less these days), and what did I see? 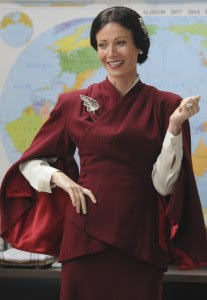 Gwyneth Paltrow as teacher Holly Holiday doing a sort of parodic impersonation of Wallis Simpson during history class. Uh, ok. Clearly, this is the year of Wally. Next thing I know, I'm googling for a pic of it and I discover, Gwyneth is considering playing the role of Wallis in another upcoming Wallis-focused project? Oh dear...please don't let it be a musical (no offense, G, but...I'm just not loving your stint on Glee)! Beautiful. You know, there is something so LADYLIKE about her, and about the women in your header pictures that you just don't see today no matter how dressed up people get. There was an elegance and simplicity about their femininity -- I can't describe it, but I know you know what I mean. I haven't watched Glee for ages, so had no idea Gwyneth was in it, but she looks amazing in that picture! Mary R. I do agree...the concept of ladylike seems to have vanished! Hi, Retro Chick! Yes, she rocked the look...and I think Gwyneth is a gorgeous and very talented actress. For some reason, though, I just don' t find her vocal performances to be as good as other people seem to make them out to be. Oh well, everyone has their own opinion, right? Good heavens! Please let Gwynnie not play Wallis under ANY circumstances, singing or not! 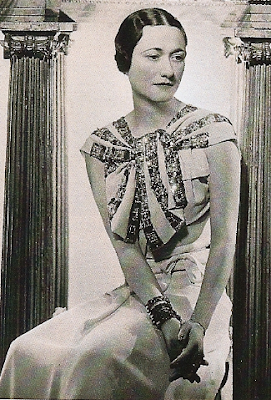 I have to say that while Wallis may have worn lovely, ladylike clothes, Wallis was NO lady. Every generation has had prettily dressed tramps, and Wallis was the elegant, smart, domineering tramp for the 30s. Hi, Dreamstress. LOL! In the 1930s (in America at least) a "tramp" was another word for hobo, and WS definitely was not one of those (or if she was, she was the best dressed one EVER). If we're talking about the other definition of "tramp," I respect your right to a personal opinion based on your own sense of morality. I personally refuse to apply words like "tramp" to other women's personal romantic/marital/sexual lives and choices. Cheers! what I do concede is that one can dress like a lady but not act in ways that may be considered "ladylike." I wasn't alive when Wallis was going strong, but definitely I am aware that Wallis was (and clearly continues to be) a polarizing figure. She also seems to be a rather complex individual (complex enough that no single biography or biopic seems able to adequately capture her). I guess what I'm trying to point out here is that, for whatever reason, in the last year or so, Wallis Simpson has come to the front and centre of popular culture...with all the upcoming movies, etc, it seems I am not the only one curious to go behind the monolithic labels ascribed to this style icon (such as the one you've given her) in order to explore someone I think was more complex than a single label could sufficiently describe.